Marie-Laure lives with her father who is the locksmith at the Paris Museum of Natural History. Despite her blindness, she spends her days exploring the museum and reading. Werner is an orphan boy in Germany with a passion for electronics and science. As teenagers, both are sent on unexpected paths when World War II takes over their lives. Their families, aspirations and futures change. 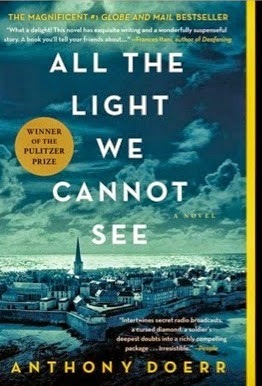 All the Light We Cannot See by Anthony Doerr is a beautiful narrative of a horrible time in history. The imagery and light that Doerr brings out in his writing offsets the destruction of both lives and cities during the war. The novel is really two parallel stories of a boy and a girl finding their way in a world that has been turned upside down. It is written in brief chapters, sometimes merely a page or two, and this style works wonderfully. Marie-Laure and Werner have completely different experiences during the war, and their worlds don't converge until quite far along in the book, but the two stories weave together well and form a full view of the war's effect on young people on both sides. I personally didn't feel more engaged with either side of the story; they both kept my interest and I found that I cared about both of these young people whose lives were torn apart by the war. If you're looking for a new take on the World War II story, a book that looks at both sides at the same time, I encourage you to read All the Light We Cannot See. Connect with the author on his website or Facebook. This review was based on a copy of All the Light We Cannot See that I purchased. This post includes Amazon Affiliate links. If you purchase something using my link, I will receive a very small commission but your price does not change. I've been seeing so much about this book and wanting to read it. Glad to hear that it is worth the hype! High on my want-to-read list! Thanks for the review - and for adding your review to the Big Books Summer list!